I often get the question, how can take better pictures? Of course, the obvious choices are classes, workshops, countless hours of reading blogs like this, etc. But the number one way to take better pictures, is to take more pictures and take them often and with intention. If you want to learn how to take better pictures with a specific camera, use that camera on a regular basis. If you want to take better pictures in manual, force yourself to use manual regularly. If you want to take better pictures in general, set goals, and pay attention to the pictures you are taking. Be intentional. Be reflective. Request feedback. Even when you are using your cell phone camera (and we all do it), thinking about the picture’s composition and lighting or purposefully setting up a photo will make an impact on your work. When you start taking more pictures, you will take more BAD pictures at first. If you stick with it and consistently practice, you will find that the number of poor shots will decrease and you’ll start finding masterpieces in your daily photos. 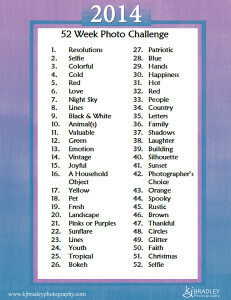 Join me with a challenge to improve your photography by taking this 52 week challenge. Each week has a theme to help us be intentional. You can post your images our private facebook group (send me a message to join), or add them to your own facebook page and tag me. I’d love to see your progress!